My husband and I are big tea drinkers. When we met, he turned me on to the difference in taste of loose leaf tea. It really was a great learning experience. Now, loose leaf is the only way we’ll make a cup of tea, which usually meant we could only enjoy it at home – until now. Libre Tea has made it possible to enjoy the flavors of loose leaf teas on the go with their new Libre Tea Mug. Starting in 2008, Libre Tea has been on a mission to inspire “tea moments” – anytime, anywhere. The latest in the Libre product line is the travel-ready glass and poly mug. The mug has a glass interior for fresh taste and a durable polycarbonate exterior that makes it ideal for travel. 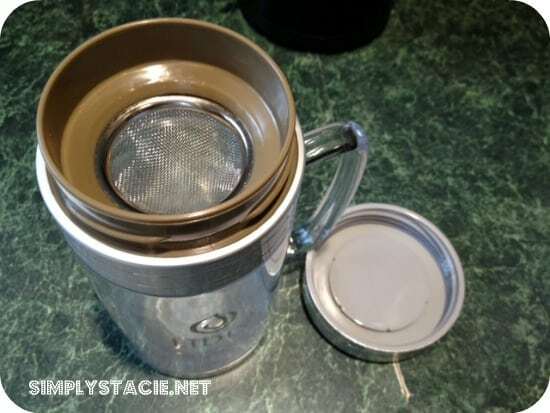 The stainless steel tea filter is surrounded by BPA free polypropylene. It’s a sturdy mug, and a generous size. 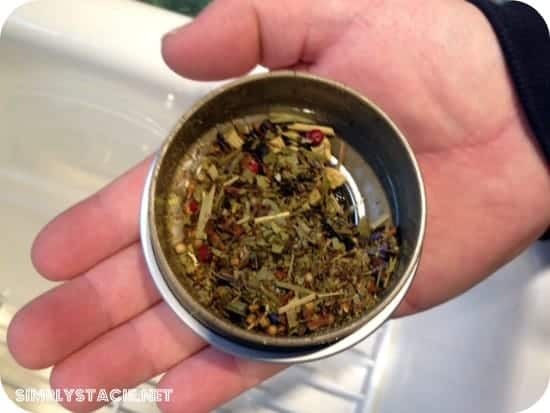 After watching the “How To” video, we experimented with brewing one of our favorite loose leaf teas over the weekend. The process was simple – add the loose leaf tea to the top filter, fill the mug with hot water, twist on the filter top, flip, and brew! We then simply unscrewed the filter top and the tea was ready to enjoy (after cooling, of course!). My husband then transferred his tea to his favorite cup, while I drank right from the mug itself. Once we mastered the art of brewing at home, we were confident that it would be just as easy on the go. It’s perfect for the office. It’s such a treat to be able to enjoy our favorite teas outside the house! It would make a nice gift for any tea-lover. You can buy the Libre Tea Mug online, or check out their list of retail partners. The mug retails for $32.50. Mirror Mirror is in Theatres on March 30th! I just learned from the Libre page that tea releases caffeine at half the rate of coffee. This explains why I can drink some tea, but coffee makes me anxious. I learned that their is a removable stainless-steel filter. wow learned the benefits of using the mug – better for the environment and no little dust! I learned that the Libre Glass ‘n Poly keeps your tea hot for approximately one hour and a half. The Tea Mug Has A Removable Stainless Steel Filter. It has a glass interior where the water touches and then a plastic exterior. b/c of less packaging, loose tea has a smaller eco footprint than bagged teas. It has a removable stainless-steel filter that keeps tea leaves in the glass, out of your mouth and ir removable for easy cleaning. During the early days of tea drinking in China, leaves were boiled with sweets and spices. In the artful Song dynasty (1100 AD) tea leaves were ground and whipped with water. It wasn’t until the Ming Dynasty (1368-1644), however, that it became common practice to steep loose tea leaves in hot water in a teapot, and then to pour the infused liquid into bowls to drink. It keeps the tea inside hot but not the glass! I learned that that loose leaf tea has a smaller eco-footprint than tea bags. I learned that they are BPA free. I learned that it has a removable stainless-steel filter that keeps tea leaves in the glass, out of your mouth and ir removable for easy cleaning. I learned that the company is located in Gibsons, British Columbia. 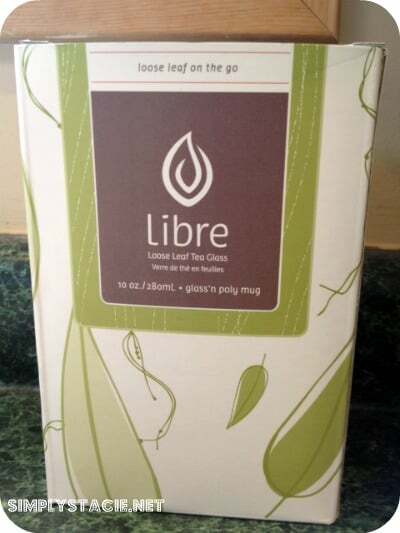 Although the Libre tea glasses are designed for loose leaf tea, they can also be used with a tea bag. Libre tea glasses are made in China. Thanks for the giveaway…”The caffeine content in tea is released in the body at about half the rate of coffee!”. 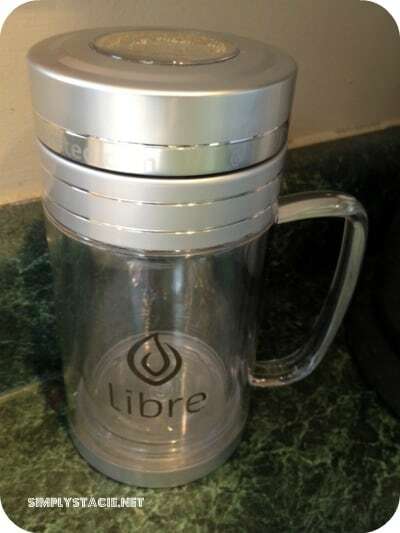 I learned that the Libre tea mug is much more than a mug. Not only does it keep your tea hot yet remain cool to the touch, but the stainless steel filter keeps the tea leaves from going into your mouth.